Goosebumps is kind of a big deal in our household. My children have been reading R.L. Stine books for as long as I can remember and when they were old enough not to be too scared, we would watch marathons of the Goosebumps TV show as it got closer to Halloween. I only have one little guy left in the house but his older siblings passed down their Goosebumps books to him when he started reading "big boy" books. 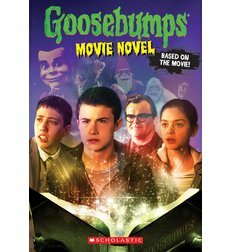 When school started in August the Scholastic order form followed close behind and on it, (circled not once or twice but three times) was the Goosebumps The Movie: The Movie Novel. How could I say no? It was to be his first brand new Goosebumps book, not previously read by his brother or sister. "Finish the book," I told Kadir, "and when you've read it we'll go see the movie when it comes out." As if I needed to bribe him. He finished the book in a matter of days* and we began counting down to the movie's release on October 16th. 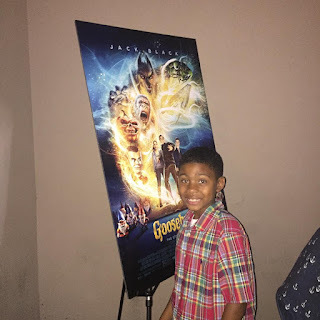 However, as luck would have it, I was able to pull some strings and get our family passes to an advance screening of Goosebumps The Movie starring Jack Black. My husband and I checked his Classroom Dojo account to make sure he had earned a Tuesday night movie date (green light) and headed to the movies to surprise our little monster. I'm always funny about kids movies. I'm never sure if I can sit through them without being monumentally bored but still have to endure them because it's a labor of love. No worries here. This isn't your typical kids movie. It's rated PG, in fact. Likely due to the fact that there are a few intense and potentially nightmare-inducing scenes (spoiler alert: I have a newfound fear of garden gnomes). The movie as a whole is not too frightening but it will leave you on the edge of your seat. Black, Rush and Minnette, narrowly escaping cemetery ghouls. To keep it short and spoiler-free, the movie follows Zach (played by Dylan Minnette), who moves with his mother from New York to the small town of Madison, Delaware. He's not especially thrilled about the move but he becomes intrigued by his mysterious neighbor, Hannah (Odeya Rush) and her overbearing and equally mysterious father, Mr. Shivers (Jack Black). Zach ignores repeated warnings from Mr. Shivers to stay away from him and his daughter and learns what secrets the two of them have been hiding. Adventures ensue and together (along with Zach's new friend, Champ) they must save the town from every monster R.L. Stine has ever written about. In a nutshell- I laughed, I jumped, I covered my face at least once and I may or may not have cried. Goosebumps the Movie was very entertaining and a totally appropriate film for the Halloween season. Make sure you don't cover your face or you may miss a very cool cameo towards the end of the film. This post originally appeared on anlamama.com and was written by me.